Anton Webern in Stettin, now Szczecin, in October 1912. 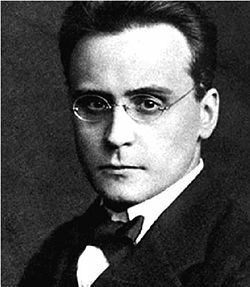 Anton Webern (December 3, 1883 – September 15, 1945) was an Austrian composer. He was a member of the so called Second Viennese School. As a student and significant follower of Arnold Schoenberg, he became one of the best-known proponents of the twelve-tone technique; in addition, his innovations regarding schematic organization of pitch, rhythm and dynamics were formative in the musical style later known as serialism. Though the twelve tone technique was not initially met with great enthusiasm by composers in the years prior to World War II, this atonal syntax nevertheless found committed adherents and eventually became a dominant compositional rationale in the post–World War II era as evidenced by the fact that Igor Stravinsky and Aaron Copland eventually composed utilizing the techniques of dodecaphonic writing. This revolutionary approach to composing offered modern composers new modes of expression and Anton Webern, more than his mentor and chief propagator of twelve-tone composition, Arnold Schoenberg, was considered the most effective practitioner of the the technique. Webern was born in Vienna, Austria, as Anton Friedrich Wilhelm von Webern. He never used his middle names, dropping the von in 1918. After spending much of his youth in Graz and Klagenfurt, Webern attended Vienna University from 1902. There he studied musicology with Guido Adler, writing his thesis on the Choralis Constantinus of Heinrich Isaac. This interest in early music would greatly influence his compositional technique in later years. He studied composition under Arnold Schoenberg, writing his Passacaglia, Op. 1 as his graduation piece in 1908. He met Alban Berg, who was also a pupil of Schoenberg's, and these two relationships would be the most important in his life in shaping his own musical direction. After graduating, he took a series of conducting posts at theaters in Ischl, Teplitz, Danzig, Stettin, and Prague before moving back to Vienna. There he helped to run Schoenberg's Society for Private Musical Performances and conducted the Vienna Workers Symphony Orchestra from 1922 to 1934. Webern's music was denounced as "cultural Bolshevism" when the Nazi Party seized power in Austria in 1938. As a result, he found it harder to earn a living, and had to take on work as an editor and proofreader for his publishers, Universal Edition. Webern left Vienna in 1945 and moved to Mittersill in Salzburg, believing he would be safer there. On September 15 however, during the Allied occupation of Austria, he met a tragic and untimely death as he was accidentally shot dead by an American Army soldier, Raymond Bell, following the arrest of his son-in-law for black market activities. In the years after his death his stature as the mature practitioner of twelve-tone technique grew in a most unexpected way. His revolutionary ideas regarding orchestration and timbre became the subject of great admiration among the leading exponents of the avant-garde. Webern was not a prolific composer; just thirty-one of his compositions were published in his lifetime, and when Pierre Boulez oversaw a project to record all of his compositions, including those without opus numbers, the results fit on just six CDs. However, his influence on later composers, and particularly on the post-war avant garde, is acknowledged as immense. His mature works, using Arnold Schoenberg's twelve tone technique, have a textural clarity and emotional coolness which greatly influenced composers such as Pierre Boulez and Karlheinz Stockhausen. Like almost every composer who had a career of any length, Webern's music changed over time. However, it is typified by very spartan textures, in which every note can be clearly heard; carefully chosen timbres, often resulting in very detailed instructions to the performers and use of extended instrumental techniques (flutter tonguing, col legno, and so on); wide-ranging melodic lines, often with leaps greater than an octave; and brevity: the Six Bagatelles for string quartet (1913), for instance, last about three minutes in total. Webern's very earliest works are in a late Romantic style. They were neither published nor performed in his lifetime, though they are sometimes performed today. They include the orchestral tone poem Im Sommerwind (1904) and the Langsamer Satz (1905) for string quartet. Webern's first piece after completing his studies with Schoenberg was the Passacaglia for orchestra (1908). Harmonically speaking, it is a step forward into a more advanced language, and the orchestration is somewhat more distinctive. However, it bears little relation to the fully mature works he is best known for today. One element that is typical is the form itself: the passacaglia is a form which dates back to the seventeenth century, and a distinguishing feature of Webern's later work was to be the use of traditional compositional techniques (especially canons) and forms (the Symphony, the String Trio, the piano Variations) in a much more modern harmonic and melodic language. 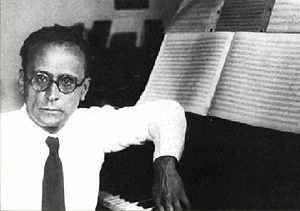 For a number of years, Webern wrote pieces which were freely atonal, much in the style of Schoenberg's early atonal works. With the Drei Geistliche Volkslieder (1925) he used Schoenberg's twelve tone technique for the first time, and all his subsequent works used this technique. The String Trio (1927) was both the first purely instrumental work using the twelve tone technique (the other pieces were songs) and the first to use a traditional musical form. Webern's tone rows are often very arranged to take advantage of internal symmetries; for example, a twelve-tone row may be divisible into four groups of three pitches which are variations, such as inversions and retrogrades, of each other, thus creating invariance. This gives Webern's work considerable motivic unity, although this is often obscured by the fragmentation of the melodic line. This fragmentation occurs through octave displacement (using intervals greater than an octave) and by moving the line rapidly from instrument to instrument (sometimes, and somewhat erroneously, called Klangfarbenmelodie). Webern's last pieces seem to indicate another development in style. The two late Cantatas, for example, use larger ensembles than earlier pieces, last longer (No. 1 around nine minutes; No. 2 around sixteen), are texturally somewhat denser. The works with opus numbers are the ones that Webern saw fit to have published in his own lifetime, plus a few late works published after his death. They constitute the main body of his work, although several pieces of juvenalia and a few mature pieces that do not have opus numbers are occasionally performed today. WebernUhrWerk - generative music generator based on Anton Webern's last twelve-tone row, commemorating his sudden death on Sep. 15, 1945. All links retrieved November 21, 2016. IMSLP - International Music Score Library Project's Webern page. Das Synthese-Denken bei Anton Webern - Dissertation by Karlheinz Essl with english abstract (1988). This page was last modified on 21 November 2016, at 15:53.